It is Christmas! Like every year – one more time. It’s Christmas – silent night, holy night! That is how it should be – and how most people expect it: something special, a day which is not like all the other days of the year, an evening, filled with peace, silence and harmony, a night which shall make us feel – let’s say: a little bit different, a night that makes the world change… Lots of people wait for this – during the last days, I often heard them talking this way, talk of expectations, of hope, of a “perfect” Christmas, like the ones we used to know when we were children, when everything was still okay, when we didn’t know about how life can be. “I’m dreaming of a white Christmas, just like the ones I used to know” – and in reality, it’s not the snow we miss (depending on where you are from, you may be happy we don’t have it – it’s already cold enough! ), but the harmony, the feeling that everything is all right, let’s say: the feeling of being at home… of having my place in the world, with the people I belong to. A place where all the problems of my every day’s life don’t have any importance – a place where, for a moment, there is something like a connection between earth and heaven – where I fit together with the world around me. Our experience is often much different from that: Some of you can not be at home – you have to pass Christmas away from your families, from good friends, away from home. Others have been busy all the days before – and haven’t found the time to get in mood for Christmas, perhaps they’re still in a hurry and can hardly fade out the stress of the last days. But everyone expects something from Christmas, dreams – no matter of the reality – of a Christmas “like the ones we used to know”, a Christmas where we can feel “at home”. Where life is light, bright, open. This is perhaps one meaning of Christmas, one part of the Christmas message: For a moment, we should not regard what’s going on around us – in this night, we may focus on Christmas, just like this picture is focussed on the candle. Of course, there is a lot around it – the rest of the house, covered with snow and ice –, but in a small instant, that’s not important. On the contrary: If we would look at all this, the light would seem too small, nearly helpless against all the cold, just like a candle in the wind. 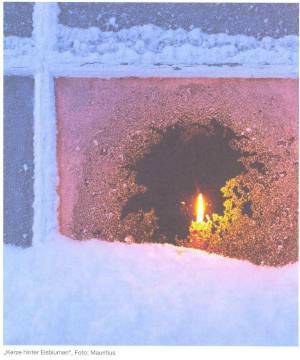 It’s necessary to come close to see that a small candle is able to melt the ice. We have to lose distance to remark what’s happening on Christmas, to see the force of the small things. There were four candles burning, with small flames, and they were talking to each other. The first candle said: “My name is peace. But no one preserves my light – I have to go out…” And it went out. The second candle said: “My name is confidence. It’s too easy to hurt me, I’m too vulnerable. There is no sense for me to burn on.” And it, too, went out. The third one started saying: “My name is love. But I don’t have enough space in the world – I should burn everywhere, but I’m too often forgotten and deceived.” And it also went out. The room slowly became darker. After some time of silence, the fourth and last candle started to whisper: “My name is hope – and as long as I burn, there is still a chance to relight the other candles, peace, confidence and love. If I also went out, if there was no hope left, everything would be lost. But with my small light, there is still a chance.” A small child entered the room, took this candle and relighted the three other ones – and the room got light. This is Christmas. It’s different from all the other nights – people are right to expect something special. Because Christmas means: God’s home is not anywhere in heaven – on the first Christmas Eve, he came to make his home among mankind. In our sorrows, even in the hardest moments of life, he is not far away, like a God who just regards earth or even is the cause of evil and problems. His place is on our side – he knows human life, be-cause he himself was born in Jesus Christ. The first Christians had that in mind when they read an Old Testament text of hope on Christmas: The people who walked in darkness have seen a great light; Those who dwelt in the land of the shadow of death, upon them a light has shined. For unto us a child is born, unto us a son is given; and the government will be upon his shoulder. God himself is the one who lightens a candle – who welcomes us – and his light will shine for everyone, in eternity, against every snow and ice: to make this world bright. May all of us have a blessed Christmas Eve! Amen.